New to the Australian market, the fantastic Eleganza European awning. The Eleganza must be the ultimate awning for serious caravaners who demand nothing but the very best. 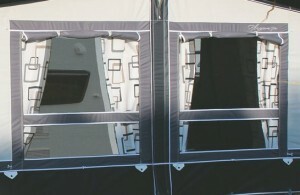 Fitted with many standard features that make camping a breeze such as the factory fitted zippable window blinds, these are a must have feature for security, shade and that little extra privacy. 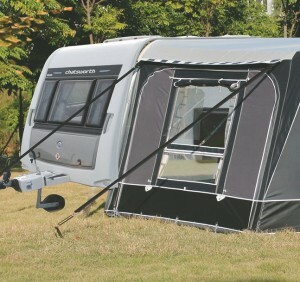 Unlike most european awnings the eleganza comes fitted with two extra storm strap clips making four altogether, this is perfect for the unpredictable Australia climate and gives the strength and security you desire when the wind and rain is howling! The Eleganza is supplied as standard within Australia with 2 storm straps, an additional 2 storm straps are available as an option. Durability was a to priority when designing the Eleganza, this awning has been produced in Climatech SR18HD an ALL season heavy duty coated polyester and the poles are a 25mm lightweight coated steel giving you total peace of mind. 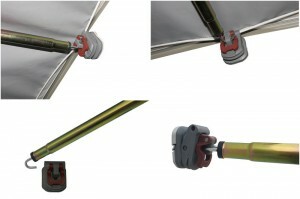 The awning poles use an innovative unilock pad which clamps onto the awning profile and means the pole never actually touches the side of the caravan, it is supported by the pad and has no need for clips or holes in the caravan, it ties the poles and awning together making everything work as one. A great feature of this awning is its ability to easily fit a standard or tall annex room to either end of the awning. This extends the usable area greatly and can be used for storage or even an extra bedroom! Dont delay, call now on 08 9467 2382 or send an inquiry! Roof Material: Climatech SR18R All Season Coated Polyester, Attractive Pattern on the Inside.